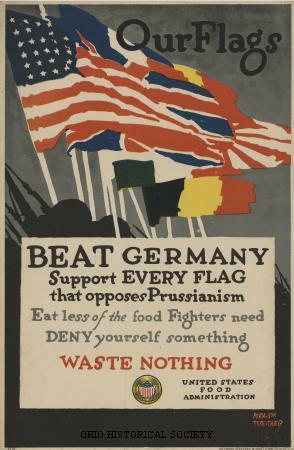 Poster with the slogan "Our Flags, Beat Germany, Support Every Flag that Opposes Prussianism." It was produced by the United States Food Administration and encouraged civilians to use food sparingly during World War I, ca. 1917-1918. World War I began in Europe in August 1914. The origins of the war went back to the late nineteenth century, when European countries competed against each other to gain colonies and trade advantages in Africa and Asia. Many people believed at this time that a country's wealth determined how much power and prestige it had within the world. They viewed colonies as a way of increasing a country's wealth. This belief led to intense feelings of competition among European countries, and some countries, like Germany, felt that they had been left out of the process. In addition, Great Britain and Germany had become involved in a naval arms race with each other. These feelings of competition created an environment in which war was possible. The war actually began within the Austro-Hungarian empire, after the heir to the throne, Archduke Franz Ferdinand, was assassinated. Very quickly a chain reaction occurred, with European countries declaring war on each other because of previous alliances that they had signed. Soon, Europe was divided into two major sides: the British, French, and Russians were fighting against Germany, Austria-Hungary, and Italy. Because many of these countries had colonies and those colonies contributed to the war effort, the war soon became a worldwide war. The United States originally chose not to take sides during World War I. President Woodrow Wilson declared that the United States was neutral, and he instructed Americans to be neutral in their thoughts as well as their actions. Despite their neutrality, Americans did take sides. Many Americans were recent immigrants from the European countries participating in the war, and they still had families there. They often supported their home countries. Irish immigrants tended to hope that Germany would win because of their historical hatred for Great Britain. Even the United States government found that neutrality was difficult to maintain. Germany used u-boats, underwater boats or submarines, in their attempts to defeat Great Britain. Unfortunately, u-boats attacked commercial shipping as well as military vessels. In one instance, the sinking of the British luxury liner Lusitania, American lives were lost. The Germans temporarily restricted their submarine activities after this incident because they did not want the United States to become involved in the war, but ultimately the German government decided that defeating its enemies was more important. In early 1917, the German government returned to unrestricted submarine warfare. The German submarine policy, other diplomatic failures, and ultimately President Wilson's desire to have an influence on the peace process at the end of the war led the United States to enter World War I in April 1917. Wilson wanted the First World War, which most people referred to as the Great War, to be a war to end all wars. When the war was over, Wilson wanted to put into effect reforms that would keep future wars from occurring. The president spelled out his goals in his Fourteen Points, which presented such ideas as self-determination (the right of peoples to decide for themselves what form of government they would have), democracy, freedom of the seas, free trade, and collective security. Wilson viewed collective security as the most important issue to prevent future wars. If all countries belonged to an international organization, which he called the League of Nations, the president believed that this agency would be able to put pressure on countries that could potentially cause wars and force them to act properly in the world arena. Many people refer to World War I as the first modern war, because of the many new forms of technology that were utilized in warfare. The First World War provided a transition from traditional warfare and these new types of technology. There were still cavalry units riding into battle on horseback, but armies also utilized new forms of transportation related to automobiles and tanks for the first time. World War I was the first war to see significant use of submarines. Artillery shells had longer range and troops used machine guns as well. This was the first war to see airplanes used, mostly for reconnaissance purposes. There were a number of battles fought in the sky, and Ohioan Edward V. “Eddie” Rickenbacker became known as the “Ace of Aces” because of his exploits. Chemical weapons were also used in World War I. One of the most common chemical agents was chlorine gas, known as mustard gas because of its yellow color. The use of new technology changed the rules of warfare, leading to a prolonged war in trenches and significant psychological effects on the soldiers who participated. Ohioans, like many other Americans, participated actively in World War I. The state hosted Camp Sherman, one of the largest military training camps in the United States. Over 154,000 Ohioans were drafted into the military during World War I, and a total of 200,293 draftees, volunteers, and Ohio National Guardsmen represented the state in the military. Approximately 6,500 Ohio troops died from battle wounds or disease during the war. Not all Ohioans were in favor of the war. Numerous conscientious objectors refused to serve in the military, and other pacifists, such as Ohio representative Isaac Sherwood, were vocal in their opposition. In spite of these objections, most Ohioans viewed support of the war and the United States government as their patriotic duty. On the home front, Ohioans actively mobilized to support the war effort. The state created the Ohio Branch of the Council of National Defense to advise Governor James M. Cox on the state's mobilization efforts. In particular, the council focused on industry and the need for an adequate supply of labor. One result of the council's efforts was the creation of the Ohio Industrial Commission, which made sure that available workers were placed in the jobs that were most needed for wartime production. In addition, the council recruited college students and other Ohioans to help on farms during planting and harvesting. Ohioans also contributed to Liberty Loan campaigns to help finance the country's war effort. Unfortunately, patriotism sometimes grew out of control. A strong anti-German sentiment developed in Ohio and elsewhere, sometimes leading to persecution of the state's German-American citizens, a rejection of German culture, and outright censorship. World War I officially ended with the signing of the Treaty of Versailles (1919). This treaty required Germany to accept responsibility for World War I and imposed reparations. It also called for the establishment of the League of Nations, as Wilson had envisioned. Unfortunately, the treaty failed to create a long-term environment favorable to peace. Germans resented the treaty's provisions, and that resentment helped to fuel support for the Nazis in the 1930s and a return to war in World War II. Although Americans were happy to see an end to World War I, the United States Senate refused to ratify the Treaty of Versailles. Republicans in the Senate were unhappy that Wilson had not included them in the negotiations and refused to vote in favor of the treaty. The United States never joined the League of Nations, and that organization failed to be successful in its attempts to prevent future wars.